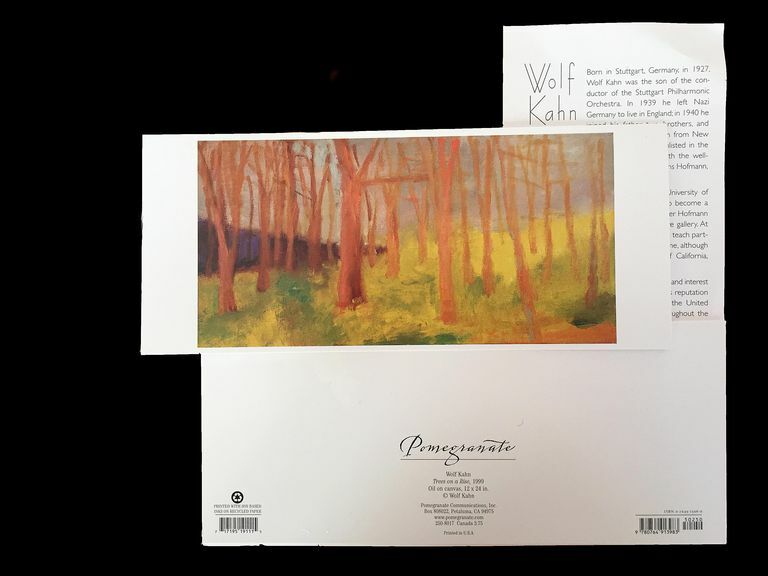 Example of notecards with image of painting by Wolf Kahn, front: image of painting, back: image and artist information. Also an insert with biographical information. 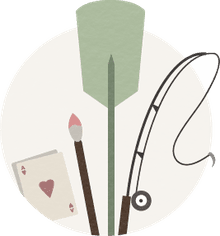 Many artists make extra income from notecards of their paintings, selling the notecards out of their studios, through their websites, at craft fairs, or through local stores or art centers. An original piece of art can cost hundreds if not thousands of dollars, costing more than many people can afford. It may also be physically larger than many people can accommodate in their homes. If you are an artist who produces larger, more expensive artwork you can earn income from your artwork in between sales of those larger pieces by selling smaller pieces at a lower price point and by making prints and notecards of your work. People who might not have heard of you yet and might not be ready to spring for an expensive original painting would be happy to buy notecards they like. The notecards will remind them of who you are and where they can find you when the time is right for them to purchase one of your larger works. The more your work is seen, the better it is for you. And cards have a far-reaching effect, literally, as the customer who buys them then sends them off to friends in other parts of the country and world. These people then receive your card, like it, and look your website up on the internet. Get that website up and running! Whether it is notecards, giclee prints, or business cards with your image on it, having a multimedia representation of your work is beneficial and important. Someone may already know your work and absolutely love it, but just can't afford an original piece of art. Notecards enable them to have a legitimate image of your work without the cost. They can even buy their own frame for the card if they want to keep it as an individual piece of artwork. People will enjoy having a boxed set of images of several of your paintings. And, it helps you save money as well. Without a lot of extra effort and expense beyond the initial printing, you can sell your cards through different venues and be earning money from sales while you're working on another piece of original art! Use them as thank-you notes to customers, as an extra gift to clients who commission a painting, as announcements for Open Studios or special events, as gifts to family and friends, or as affordable items for sale at gallery or art show openings. You can hang on to the original painting until the right buyer comes along and can pay full value for it. And as the creator of the original artwork you still have all the copyrights, so you can create as many cards and prints from a popular painting as you would like. Choose several of your best paintings and scan them for the best color control or take good quality photographs of them. You want to take the highest resolution possible, which is 300 ppi (pixels per inch) for image clarity. Follow the specifications of the Print on Demand company you're using for sizing and uploading your images. You also might choose to use a close-up of an image on the notecard. Just be sure to convey that the image is a "detail" from the original painting when you include the information about the image. It is good to put information about the image - title, medium, and size - your name and copyright symbol, your website address, and any brief statement about your art on the back of the notecard. That way, when someone far away is admiring the image, they can turn over the card and easily find out how to get in touch with you! If you want to have more control over your images and sign each one personally, you can print them at home if you have a printer that can print good color photographs. Choose your best images and color-correct them using photoshop or other photo software. Some artists use Microsoft Publisher to print their image directly onto their card. Others print out their images separately and adhere them to the card. If printing your images out separately, print them out a little smaller than your card size. You can order blank note cards or greeting cards that come with envelopes such as Avery Textured Heavyweight Note Card and Envelopes, which are like watercolor paper. You can print your image separately on any stock photo paper - glossy, satin, or matte, depending on your preference, and adhere it to the note card with a glue stick, spray glue, rubber cement, or scrapbooking tape. Some artists have their images printed successfully at Walgreens or another store relatively inexpensively. Sign your card, make sure the name of your artwork and your contact information is on it, package it in a clear bag and you are done. You might want to have a stamp made with your contact information so you don't have to write it all by hand on the back of each card if you are producing many cards. Or you might want to include your business card in the bag with your notecard.